This rig will weigh in at 57 or so pounds. This is probably due to the fact that it has an internal power supply. The main receiver is completely down-conversion. The sub receiver is the TS-590’s receiver. They even told me that if you read the TS-590S spec, it will be identical to that of the TS-990S sub receiver. As with the TS-590, the TS-990S sub receiver is mainly down-conversion. It has five roofing filters at: 300Hz, 500Hz, 2.7 6kHz and 15kHz which run at 8MHz. The sub-receiver runs at 11MHz. Price: Between $5-10K US, but will not exceed $10K US. Two different Kenwood reps told me that Kenwood understands that there aren’t many hams in this economy who could spend in excess of $10K. These specs were rattled off as if they’d been said a thousand times (and I bet they had by the time I got around to the booth). Not a lot to go one, but I can vouch that these features and specifications came directly from Kenwood. This entry was posted in Announcements, News, Product Announcements and tagged Dayton, Dayton Hamvention, Hamvention, Kenwood, Kenwood TS-990S, TS-990 Specifications, TS-990S, TS-990S Preliminary Specifications. Bookmark the permalink. This radio is too complicated, too many knobs, much too expensive. I like simple things. This transceiver is meant for a very big ego, I guess. No. This radio is too simple! 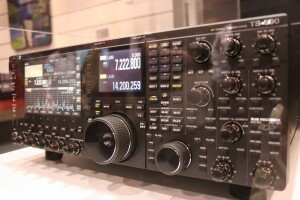 In fact, it is a radio for the true and serious ham operator thats is truely a DX and a contester. With a radio like this you never had to loose time entering in too very long menus and searching the item you need to change in radio. In fact, you simple in a blink of an eye choose the function or item you need. You really have not a clue of what are you talking about. See you have a FT-817 ! An FT-817 will not work the same DX as a TS-990S. See you have an FT-817 ( simple radio). like the TS-990S DX machine ! TS-990S is a radio for those real DXers chasing DX. traveling at the speed of light !! Heard stations the FT-817 could not hear ! Only wish I could afford one !! Oh well, keep dreaming ! !